Hands-Free with my VTech Phone - Multitasking At its Best! At any given moment at home, I’m attempting to do four things at once. Empty the dishwasher. Make the kids a snack. Talk on the phone. Feed the cats. Make myself a cup of coffee. Need I go on and on? I’m like any other Mom in the house – busy and multitasking several different things at once. So having a hands free phone is a huge help. I had tried a few head sets in the past and never found anything that had a decent quality that was good enough to hold an extended conversation on. But I have one now that I love. 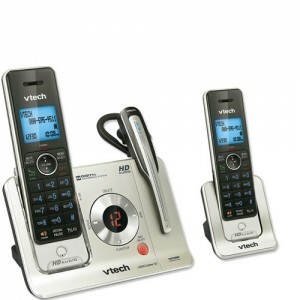 The new VTech LS6475-3 cordless headset phone system ($99.95 with free shipping) is awesome. I have asked several people if they can tell the difference when I’m on the headset versus and phone and no one can. It’s top quality and it makes my life remarkably easier for those harried moments. -If you don’t have a voicemail package with your phone service, it comes with a digital answering machine! Originally published on 2011-09-13 by Whitney at Mommies with Style .